The landscape last week transformed in a blink from dull November to dazzling winter. Tuesday the kids scored a snow day from school – an occurrence so rare in these parts that it threw us all for a loop. At first, I was aggravated by this unanticipated day off from school, which came after a three-day weekend and on top of a to-do list already lengthened by two days away the previous week. The kids, of course, were thrilled – both by the bonus day off and by the snow quickly covering the world outside. As I shuffled my schedule to accommodate work and mom duties, they dug out winter gear and headed out to play. Occasionally I’d glance up from the keyboard, relocated for the day to the dining room table, and catch a glimpse of a sled flying by or a shovel being dragged into the front yard or a snowman taking shape in the frosted-over perennial bed. It was perfect “snowball snow” – wet, dense, and easy to shape. Soon the kids had figured out that if they started at one end of the yard with a fistful of packed snow and kept rolling, they ended up at the other end with haybale-shaped snow forms nearly as high as they were. Slowly, the yard filled with large snow sculptures. Eventually, I gave up and pulled on snow boots, jacket, and mittens to join the fun. I helped the kids roll bigger and bigger snow bales, packing and lifting and piling the wet, heavy snow where they directed. At one edge of the yard, my son built an igloo, heaping snow into a huge mound and hollowing it out from within. My daughters rolled snow, one giant ball at a time, into a circle to create a Stonehenge-looking fort, complete with seats and backrests and an arced door to crawl through for entry. The temperature dropped that night, freezing the kids’ soft-snow creations into solid forms in the front yard. Since then, they’ve been dusted by flurries, softened by the sun, and refrozen several times. 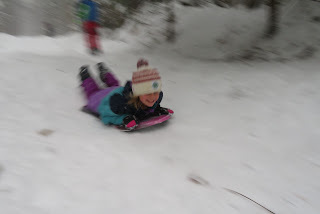 And the kids have spent hours outside – in both daylight and the pre-dinner darkness of November evenings – careening down our tiny sledding hill, fitting sneakers into old ski bindings to slide around the yard, adding features to their initial snow creations, and joining an epic snowball fight. Beyond transforming the landscape and providing the kids with endless opportunities for outdoor fun, the snow has helped me to shift more readily toward winter, too. While much of my work this time of year – and beyond – relates directly to snow and skiing, I have been hesitant lately to embrace the busyness the season brings. I was lamenting the dark and the cold, the arrival of endless early mornings for the next many months, the severe diminishment of downtime. That all changed as the world transitioned to white last week. I’m ready now. Let it snow. Original content by Meghan McCarthy McPhaul, posted to her blog, Writings From a Full Life. This essay also appears as Meghan's Close to Home column in the November 23, 2018 issue of the Littleton Record. When I wander into my children’s elementary school these days, I am always astounded by the adorable smallness of the kindergarten and first grade students. More than once this year I’ve remarked, “They’re so tiny!” to another parent or teacher, who then reminds me that my kids were that little once, not all that long ago. Then I remember how big the 6th graders seemed when I first walked into school with my two kindergarteners. The “big kids” towered over the littles. They moved confidently through the halls, laughing and talking all the way, oblivious to how BIG they were. Now my two oldest are 6th graders, and even my own littlest is one of the “big kids” now, in 4th grade. The kids who were 6th graders when mine started kindergarten are now high school seniors – “big kids” in a whole different way. There were several aspects of being 6th graders my older two children happily anticipated as they started this last year of elementary school. Sixth grade is the culminating year at their school, their seventh school year traveling the same hallways, playing on the same playground, and following the same schedule. Finally, they would be the BKOC – the Big Kids on Campus. One of the things I love about their school is that the older kids are encouraged and guided to become leaders in various activities. While they were looking forward to a new teacher, FIRST LEGO League, and just being the oldest, the kids were most excited about the responsibilities that come with being in 6th grade: leading mixed-age Peace Groups, working with the 1st graders on various projects, planning and orchestrating the school-wide end-of-the-year Festival of the Arts. Last week, the 6th graders helped the 1st graders carve pumpkins. The older kids also paired up with their 1st grade partners during the annual Halloween parade through town – one of my absolute favorite Franconia traditions. With no littles of my own needing help with costumes or maneuvering the route, I joined the crowd of parents, grandparents, friends and neighbors gathered to watch the procession of super heroes, princesses, goblins, and vampires stroll through town. I watched as one of my sixth graders (the other was in Boston for a different parade) shepherded her two 1st grade charges from candy bowl to candy bowl, the littles each holding tightly to her hands. It’s not quite true to say the transformation from wide-eyed, gap-toothed little kid to self-assured, take-control big kid surprises me. I’ve watched it happen, gradually, over the years. What’s surprising is how quickly those years seem to pass. When I close my eyes, I can still see my own 1st graders, small and sticking close to my side. When I open my eyes, those same kids are nearly as tall as I am and branching out more and more, realizing little by little that there’s a whole big world out there. As much as my 6th graders are embracing this school year, there is also some trepidation about what comes next, as they worry about being ready for middle school, leaving the familiar boundaries, stretching just a bit into that bigger world. I’ve watched other classes of sixth graders, though, and I know once April vacation hits, these kids will be looking more forward than backward. They’ll be ready for the next step, eager – if still anxious – to move on. For now, they’re busily preparing for the upcoming FIRST LEGO League competition and starting to plan for Festival of the Arts. And they’re looking forward to their next project with the 1st graders, building gingerbread houses in December: a sweet tradition, in more ways than one. Original content by Meghan McCarthy McPhaul, posted to her blog, Writings From a Full Life. This essay also appears as Meghan's Close to Home column in the November 8, 2018 issue of the Littleton Record.